But look at it in another way, why did the FBI care? So what if the DEA and Suffolk DA did an investigation that resulted in Whitey being taken down. Shouldn’t the FBI rejoice that such a criminal was taken off the street? Or, was it part of its agreement with its TEI Whitey that he would be protected at all costs so he could continue his criminal ways. The only embarrassment would have been that the FBI was protecting these criminals and if it would have been embarrassed by doing that then one must ask why was it doing it. The SAC did not stop there. He then had to impugn the integrity of Flanagan. He wrote: “I am not surprised at the attitude of DA Flanagan . . . [who] has proven to be an ineffective local prosecutor on any matters relating to organized crime or public corruption.” Flanagan was a prosecutor in Boston 32 years. He became DA in 1978 and reelected four times. In 1992 he was Executive Director of the National District Attorney’s Association a job he kept for 12 years. He was a man of the highest integrity. Had Hoover been alive he might have tried to prevent Flanagan from gaining that distinction based on the scurrilous memo by the SAC. The SAC continues saying he knows Connolly has a matter pending before the OPR (Office of Professional Responsibility that investigates those accused of misconduct or crimes) but continues “SSA Connolly is held in extremely high esteem by the Criminal Investigative Division and himself.” In a dozen years the FBI would have turned on him and said he was a rogue agent. Morris testified he took money. He also testified he tipped his informants off about FBI wiretaps. Unlike Agent Connolly, Morris was also shown to have been talking payoffs from the only other TEI he was involved with. Morris would end up keeping his pension, become a government witness, and not spend a day in jail even though he testified his actions may have contributed to some of Whitey’s murders. Connolly has been in prison since 2002 and will probably die there. He has done more time and heavier time than Martorano who murdered 20 people. The SAC ended by saying: “I have informed no one in the FBI of this discussion and will not do so until I hear from you directly.” He called the situation awkward and delicate and wrote that he awaited hearing from the director. I have no idea of the director’s response. I do know SAC Ahearn’s response was typical FBI. Rather than looking at its house to see it had problems, it attacked others trying to do their jobs in good faith. It brought in other people trying to obfuscate the issue. The lights were flashing red that it was protecting a bad person but it ran right through them preferring to believe everyone else was out of step other than itself. This tells much about the FBI. 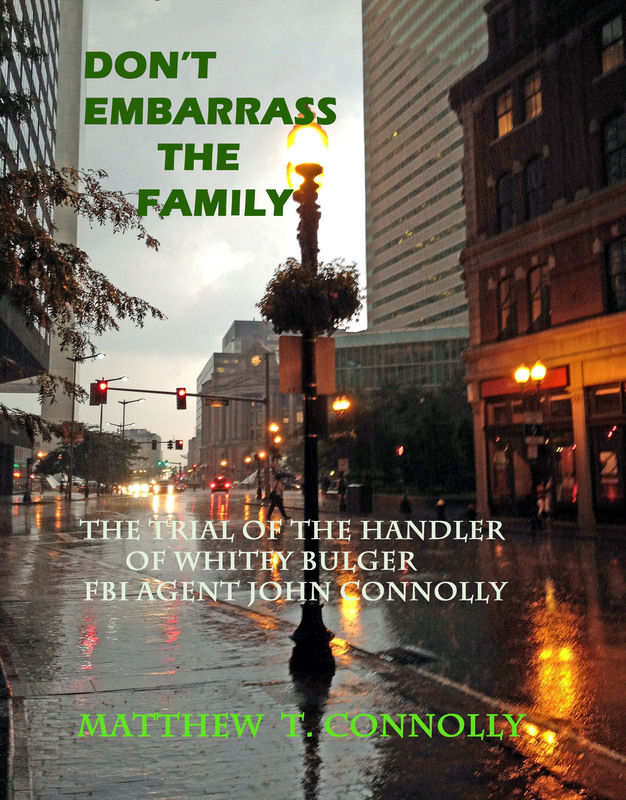 It also casts a light on John Connolly how he was doing his job handling Whitey but when the FBI cover-up of him being an informant came undone he was tossed aside by the organization he served for twenty years. The most corrupt agent John Morris gets a pass; murderers do less time than an FBI agent who has received a death sentence; and less time than a woman to whom knowledge of Whitey’s crime were wrongfully imputed. If the FBI didn’t know whitey had murdered people how was a dental hygienist who fell in love with him to know. Yet, she has been sentenced to almost 9 years in prison and faces and additional four or five. Sadly the Boston media intent on making Whitey into much more than he ever was, and ignoring the untoward and despicable deals handed out by the government to murderers who worked with it, embrace the idea that some type of justice is being done when non-violent people do more time than murderers. The media’s stone silence is is mandated by its past malfeasances. Like the FBI it fails to look at its own corruption. I can’t help wondering what this part of the world will be like when the BostonFedGlobe eventually collapses, as I expect will happen to much of what is now called mainstream media. I suppose los Federales will then cozy up to the Boston Herald, depending on what shape that newspaper is in, or cozy up to whatever media is left standing. Or will the world be closer to what Jefferson feared, a government without newspapers? In that case, the feds will cozy up to some compliant bloggers…or start blogging (under one or more fronts, naturally).